Sir Henry Morgan, a Welsh buccaneer, most famous of the adventurers who plundered Spain 's Caribbean colonies during the late 17th century. Operating with the unofficial support of the English government, he undermined Spanish authority in the West Indies. Morgan flew under papers from King Charles of England, hence he flew one of the most dreaded jacks of piracy known to the Spanish Main. Morgan's origins and early career are obscure. 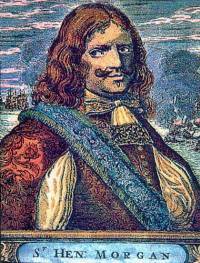 During the second Anglo-Dutch War (1665-67), he was second in command of the buccaneers operating against Dutch colonies in the Caribbean. Crossing the Isthmus of Panama, he defeated a large Spanish force (Jan. 18, 1671) and entered the city, which burned to the ground while his men were looting it. On the return journey, he deserted his followers and absconded with most of the booty. Because Morgan's raid on Panama had taken place after the conclusion of a peace between England and Spai , he was arrested and transported to London (April 1672). Nevertheless, relations with Spain quickly deteriorated, and in 1674 King Charles II knighted Morgan and sent him out again as deputy governor of Jamaica, where he lived as a wealthy and respected planter until his death.